Steve Jobs, Bill Gates, Sergey Brin, Larry Page, Mark Zuckerberg—you get the point. The computer industry was once dominated by women. Programming, computer design, computer maintenance, innovation, even “war machines”—computers used to decrypt enemy communications—were all traditionally feminized careers in the ‘40s and ‘50s. Even so, the historical narrative has failed to reflect the rich history of women in computing, and allowed this blatant omission to further confuse the misperception of women as inferior, incapable, or otherwise disinterested workers. Take one look at the demographics of the industry today, and you’ll see why the above names are all the names of men. Ask yourself, where did all the women go? The answer to this question is more telling of the mechanics of our male-dominated society than you may like to believe. And if those underwhelming figures tell us anything, it’s that there is significant room for improvement in the role that we let gender play. 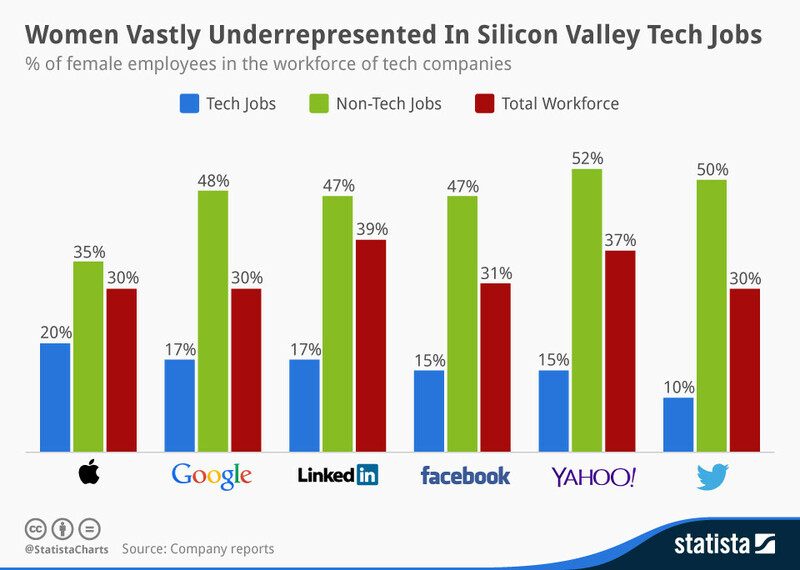 Statista company report on female employment in Silicon Valley. And with the light of social change shining through the cracks in our faulty social structure, we must continue to identify opportunities for real change , even if there are forces at work that want to stop it. And believe me, there is an opportunity here. 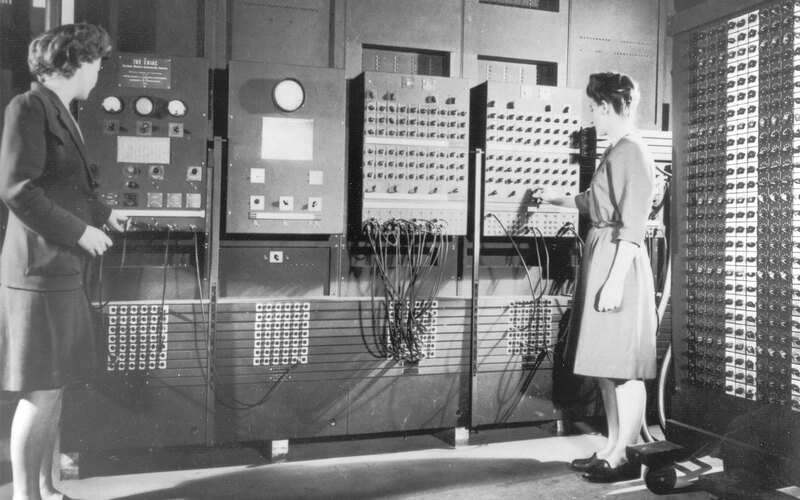 The early history of electronic computing is flush with contributions from women. Whether you’re talking about Grace Hopper, Jean Bartik, Dame Stephanie Shirley, or Lynn Conway, it is undeniable that women have left a lasting mark on the industry. Yet, the narratives which detail the history of many of their contributions focus on the great men that have been involved in the narrative, rather than the roles of the pioneering women. 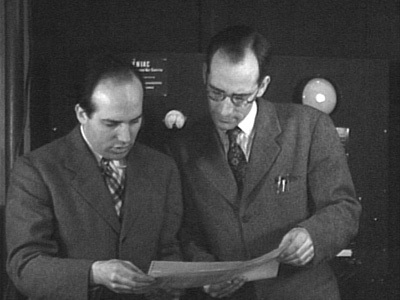 The ENIAC, for example, is largely attributed to J. Presper Eckert and John W. Mauchly, who have since become household names for their involvement with America’s first electronic computer, which automated ballistic trajectory calculations for the US military during WWII. What the popular narrative of the ENIAC leaves out, is the role of hundreds of women, and in particular, 6 very important woman programmers. J. Presper Eckert and John W. Mauchly (Ohio History Central). Namely, Kay McNulty, Betty Jennings, Betty Snyder, Marlyn Meltzer, Fran Bilas, and Ruth Lichterman were the original programmers of the first American electronic computer, and they have traditionally been little more than a footnote in the history of the ENIAC. This is not an isolated incident, either. It’s a trend in the annals of computer history. Women operating the ENIAC’s main control panel. Image from the archives of the ARL Technical Library. Left: Betty Jennings, right: Fran Bilas. So… why did this happen? In the United States, as computing became an evermore critical industry, with increasingly favorable odds of vital (and high-paying) jobs, the traditional gender roles of our society were challenged by the dominant role of women in the industry. During WWII (and shortly after) the role that women played in the computer engineering and design industry was at its climax. Yet, American wartime literature minimized the complexities of this type of work, classifying the occupation as clerical in nature, and altogether subprofessional. 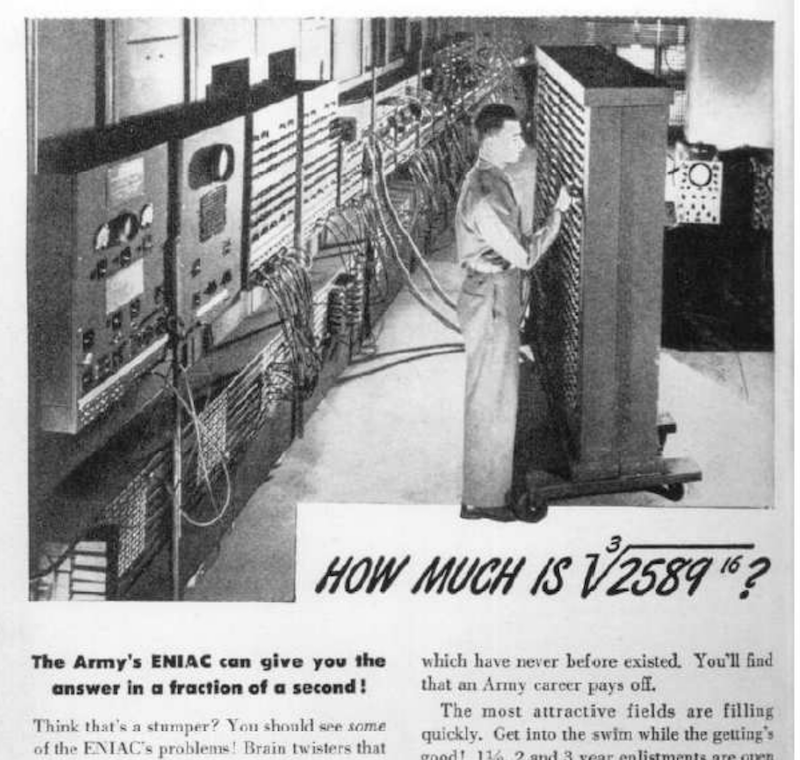 In the above article, the ENIAC is pictured with a male operator, even though the vast majority of operators were, in fact, women. It was typical of much of the imagery from the early era of electronic computing to omit women who were often integral to the operation, and substitute them for men. According to MIT professor Jennifer Light, wartime literature also showcased the femininity of the work done by women, rather than the merit. Despite the complexities and groundbreaking aspects of the work performed by women during this time period, they hardly got any credit for innovation (and still don’t). Even before women transitioned into the role of the programmer, when they were still called “computers” (yes, computers used to be women), they were computing highly complex scientific calculations, yet their jobs were classified as simple clerical work. Slowly but surely, as the prospects of the computer industry looked up, and the hard work done by women continued to be downplayed, American companies began hiring more men, stopped promoting women, and just like that, the unprecedented edge had by women over men shrunk into nonexistence. Across the Atlantic, something very different happened. Britain led the way in the computing industry, beating the USA to the first electronic computer in the world, the Colossus. The Colossus, which was also predominantly maintained, used, and programmed by the Women’s Royal Naval Service, and which actively affected the outcome of the war, was shelved upon Allied victory. So were the women who worked on it. The women who worked on the Colossus were sworn into secrecy, and couldn’t mention their work (let alone put it on a resume) until the British government reluctantly declassified the machine, decades later. And with the loss of its woman technologists, Britain altogether lost its computer industry to the Americans. But how can this be a source of positive change? The narrative of computing being a historically male-led industry is as discouraging as it is inaccurate. It’s no wonder that computer science courses in our major universities are mostly occupied by male students. It’s no wonder that the highest ratio of women to men in the tech industry today is 37 to 63, and that’s at Amazon. It all starts with history, with the social roles into which we are all born. If we change the narrative not just in the history books, but in our schools, at our homes, and most importantly, in the hiring manager’s office, we stand a chance at actually changing things for the better. But what does that mean, change for the better? Our world consists of many industries, not just computing. And nearly every industry is skewed against women, whether in terms of total employment, or in terms of a wage gap. As tech continues to grow, however, it will come to dominate all of the world’s industries, whether by muscling out more traditional methods, or by integrating with them. And if the ratio of women to men in tech can somehow be affected by improving the historical account of their importance and involvement, we may have an avenue for affecting the overall station of women in competitive workplaces. This, of course, is an oversimplified model of reality, as it doesn’t address intersectionality in tech. It’s not just men who are dominating the computer industry, it’s white and Asian American men, according to DataUSA. Other ethnicities, and especially female members of other ethnicities, are completely out of the picture, and always have been. This is an extremely difficult and daunting problem to tackle. We can’t simply “tweak” the narrative to include intersectional groups like we can with the narrative of female technologists. I do believe, however, that if women as a whole are able to take ownership of their own narrative by teaching their friends and daughters about the rich history of women in computing, it will not only benefit women as a whole, but also countless intersectional classifications. If we can take back the narrative from the history books, from the media, from the misperceptions of hiring managers (among other workplace functions), we have a chance to change the contours of society in such a way that women could be within reach of true (or almost true) gender equality, at least in terms of the workplace. You can start by sharing this article with as many women as you know, starting a dialogue on social media, or just bringing it up at the dinner table tonight. I thought I had a confidence problem. Turns out, I was just selfish. Yona is Codal’s technical researcher. At Codal, he is responsible for content strategy, documentation, blogging, and editing. He works closely with Codal’s UX, development, marketing, and administrative teams to produce all manner of written content. You can check out his work on Codal’s blog, Medgadget’s blog, and Usability Geek. In his free time, Yona is an avid guitarist, cook, and traveler.